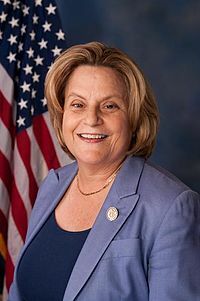 Ileana Ros-Lehtinen (born Ileana Carmen Ros y Adato; July 15, 1952) is the most senior U.S. Representative from Florida, representing Florida's 27th congressional district. She served as Chairwoman of the House Foreign Affairs Committee from 2011–2013. In 1989, Ros-Lehtinen became the first Cuban American and Latina elected to Congress. She was also the first Republican woman elected to the House from Florida, and is currently the most senior Republican woman in the U.S. House. Ros-Lehtinen gave the first Republican response to the State of the Union address in Spanish in 2011, and gave the third in 2014. ↑ "I Vote My Conscience". Human Rights Campaign. Winter 2013. pp. 17–19. http://issuu.com/humanrightscampaign/docs/winter_2013-equality-magazine/23?e=0/1818540. Retrieved January 29, 2014. ↑ "Ros-Lehtinen to deliver Spanish SOTU response". The Hill. January 28, 2014. http://thehill.com/blogs/blog-briefing-room/news/196639-rep-ros-lehtinen-to-deliver-state-of-the-union-gop-response-in. Retrieved January 28, 2014. Pages in category "Ileana Ros-Lehtinen"
This page was last modified on 17 October 2017, at 12:46.